A.J. 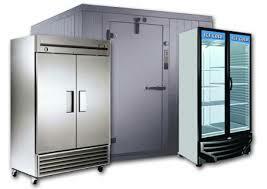 Michaels can handle your business’ refrigeration installation, maintenance and repair needs. Anything from a deli or flower cooler to walk-in freezer; from a commercial refrigerator compressor to chillers on a commercial ship. Anywhere in the central Maryland area. Remember, too: we’re available for emergency service. With highly trained, experienced technicians and a guarantee that you’ll be satisfied with our work. And with our promise that we will never charge you extra for service on nights, weekends or holidays.